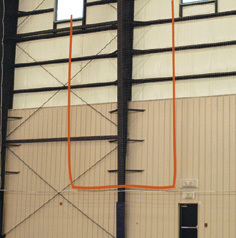 The GOAL NET is designed for an indoor field house. 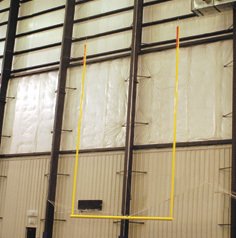 The outline of a crossbar and uprights are sewn onto a regular End Zone Net. Bright yellow 4" tape stands out against the black netting. Uprights 30' tall. Crossbar available in 18'6" or 23'4" width. Grommets along the top border. Weighs 35 lbs.